On site accomodation: the bunkhouse - We offer very basic, shared, accommodation on the property in our bunkhouse at R180 per person per night, self-catering. Six people can be accommodated, sharing 3 rooms. All bedding, towels, cutlery, crockery etc. is provided. There are two fully equipped kitchens with a small fridge/freezer, microwave oven, slow cooker, small stove/oven and all the cutlery and crockery you will need. There are braai facilities as well as a wood-burning pizza oven - bring your own wood and charcoal. There are heaters in each room as well as electric blankets on all beds for our cold winter nights. Open parking within the garden is provided. Evenings in the bunkhouse can be spent watching our library of knifemaking DVD's. The bunkhouse has Wi-Fi. Our bunkhouse is reserved for our students. Woody's offers self-catering accommodation in town 013 253 0952, woodysplace@mweb.co.za. De Akker Huize, self-catering accommodation, 013 253 0123, cell 072 365 0963. Cozy Moon Overnight Accommodation is just 1.5 kms away from us, self-catering accommodation 082 300 9090 or 082 498 2715, cozymoonbooking@gmail.com. 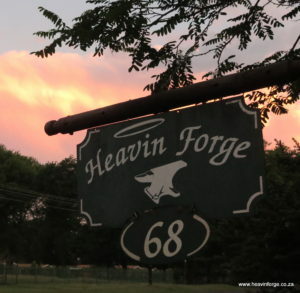 Should you wish to bring your family with you and would like a larger place, consider Van Staden Country Guesthouse 072 145 8142 (3 kms out of town), and Lakenvlei 013 253 0550, 10 kms outside Belfast is very luxurious also with excellent fishing. There are many accommodation places in Dullstroom which is 30 kms away, please look at the two websites, www.dullstroom.co.za and www.dullstroom.biz for further information. Due to the long hours working each day, there will not be much time to spend with your family if they come with you. Heavin Forge Bladesmithing Studio and School. Food - Please bring your own food as there will be very little time for you to do shopping. If you are a vegan or have any special dietary needs, please bring your own supplies as our town has only very basic shops. If you are flying into Johannesburg and coming up by bus, we will help you with your shopping needs. Our Spar closes at 6 pm during the week and 1 pm on weekends. Belfast has a few takeaway places in town. Kentucky Fried Chicken and Steers are at the Shell garage in town as well as a Wimpy on the N4. Dullstroom is only 30 kms away with a variety of good restaurants. Clothing - As far as the workshop goes, all you need to bring with you are clothes that you don't mind getting dirty, preferably cotton clothes for forging and closed comfortable shoes. Jeans or cotton long pants are needed for forging. Bring warm clothes as it can get very chilly, even in summer! Transport options - If you would like to catch a bus from the O.R Tambo airport or Lanseria airport, please phone Lime Time Shuttle on 086 999 0978 or City Bug on 013 753 3392. They stop at the Engen/Wimpy on the N4. and we can collect you from there. We can collect you and help you with transport for your shopping.